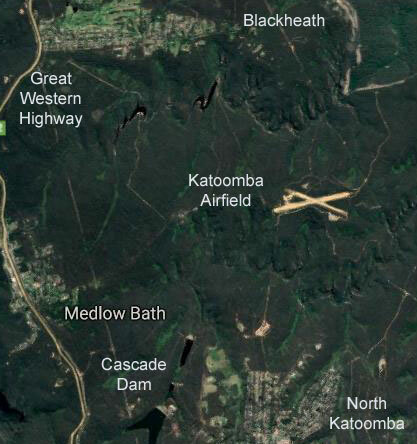 Katoomba Airfield is located on Grand Canyon Road, Medlow Bath. The airfield is public (Crown) Land and is managed by the NSW Government through the Department of Industry–Crown Lands. It is completely surrounded by the Blue Mountains National Park. The Department of Industry is currently considering negotiating a new long-term commercial lease over Katoomba Airfield to a private commercial operator. The previous leasee’s rights over the airfield were forfeited in 2017. In Sept 2017 the Department of Industry called for Expressions-of-Interest (EOI) from parties interested in leasing the site. As a result of the EOI process, in February 2018, an interim license was issued to a private commercial operator. The Department of Industry has advised that the licensee was invited to submit a business plan setting out their commercial plans for the site, in preparation to the Department issuing a long-term lease. The Department of Industry has also advised that once a decision has been made to enter into negotiations to issue a commercial lease, a community consultation process will occur. No community consultation on options for the future of the airfield occurred prior to the EOI being released or the interim license being issued. Can Katoomba Airfield be incorporated into the national park? The NSW Government via the Department of Industry (Crown Lands) has previously carried out many studies of the site, culminating in a recommendation in 2000 that the area be added to the Blue Mountains National Park, with the airfield being used for emergency purposes only. Blue Mountains City Council have previously opposed the continuation of a private lease over the Airfield, requesting that the land be incorporated into the Blue Mountains National Park in 1999, 2000 and 2008. Likewise the National Parks and Wildlife Service (NPWS) has previously supported the Katoomba Airfield being incorporated into the National Park, with the airfield managed for emergency and bushfire fire-fighting purposes. The National Parks and Wildlife Service manages a number of airfields within national parks for management and emergency purposes. Specific funding to manage the airfield could be allocated to National Parks from the Bushfire Risk Mitigation and Resilience Program managed by NSW Treasury. The Conservation Society is working with local residents and community groups to ensure that any proposed use of the airfield does not affect residents and compromise the conservation values of the Blue Mountains National Park and in particular the Grose Wilderness Area. These letters can be found on our 2018 Submissions webpage together with the replies received. There's also an article on pages 8 & 9 in the October Hut News, and a recent article in the Blue Mountains Gazette. Here's the proposed timetable as supplied in an email from the Dept. of Industry. Aircraft movement in the Blue Mountains can be viewed on the Flight Radar website. The Department of Industry will be deciding whether or not to proceed with the process of negotiating a commercial lease during March and April 2019. The community needs to urgently make their views known. Write to Scott Mullen scott.mullen@crownland.nsw.gov.au, Crown Property Services, Department of Industry - Crown Lands and Water, PO Box 2185 DANGAR NSW 2309. Also to Mark Maloney mark.maloney@crownland.nsw.gov.au. Ask that the process of issuing a lease be stopped until after some meaningful community consultation over the future of the airfield is undertaken, considering all options. Ask that you be considered a key stakeholder in any upcoming community consultation process. Object to the lack of community consultation prior to entering into commercial lease negotiations. Object to the issuing of a long term commercial lease over Katoomba Airfield. Support the inclusion of Katoomba Airfield into the Blue Mountains National Park, to be managed as an emergency airfield, with specific funding provided to the NPWS for management. Send a copy to Trish Doyle MP, Member for Blue Mountains at bluemountains@parliament.nsw.gov.au.